Expanding barriers are the easy and economical method to protect your business and improve security and safety at your factory and workplace. Current legislation places responsibility on all businesses to ensure the health and safety of staff and the public. 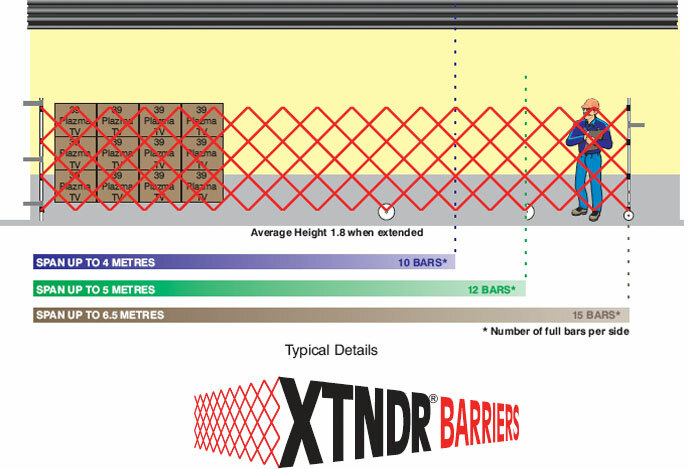 'XTNDR' expanding barriers can be used to create safety zones by restricting entry or the isolation of hazardous areas and or equipment. These expanding barriers are lightweight, easy to use and are effective. Their closed footprint is minimal (less than 10% of the total span). Expanding gates control the access to workshops, create a safe zone for visitors and children. The expanding barriers are available in 2 heights, 1.4m and 1.8m, span up to 6.5m and can be parked through a range of 90° pivoting about their fixing post.